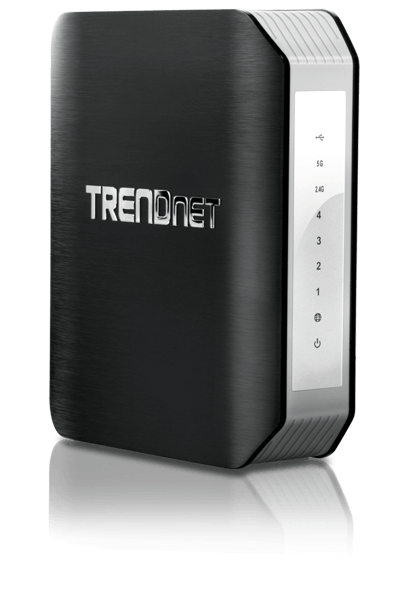 TRENDnet’s AC1750 Dual Band Wireless Router, model TEW-812DRU, produces the ultimate wireless experience with gigabit wireless speeds. Manage two wireless networks—the 1300 Mbps Wireless AC band for the fastest wireless available and the 450 Mbps Wireless N band to connect common wireless devices. The TEW-812DRU can easily handle the demands of multiple HD streams in a busy connected home. Plug in a USB flash or NAS drive to share HD videos and music across the network. Gigabit ports on the back of the router maintain high speed wired connections. Create a secure isolated guest network for guest internet access. Wi-Fi Protected Setup (WPS) connects other WPS supported wireless adapters at the touch of a button. Manage access to websites and file types with advanced access controls.